If the Throttle or Control Cables on your lawn mower seem to be malfunctioning, replace them with new parts from Jack's. We can supply you with throttle controls, conduits, push pulls, and other control cables and throttle accessories. When your equipment fails to change speeds, or your lawn mower's self-propel drive isn't working, you may have to repair the throttle cable or control. Get your equipment back up to speed. Select your manufacturer below, like Briggs and Stratton, Gravely, John Deere, Honda, Toro, and MTD. 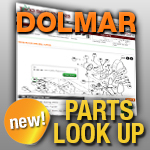 Visit our small engine parts section for more engine parts.